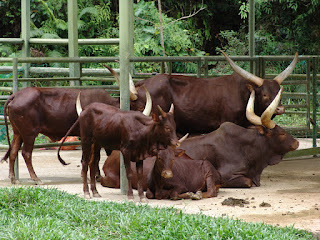 Ankole Cattle have large, distinctive, almost over-sized horns. The cattle have for centuries been an intricate part of African culture and were used as a source of food, currency for trading and status. The king of each tribe would often own the cattle with the longest horns, and these were considered sacred. Able to thrive in the excruciating heat of Africa, the cattle have adapted to survive. Part of their ability to withstand great temperature in arid environments, lies in the big horns, which are honey-combed with blood vessels. The blood flows into the horns where it's cooled by moving air, before flowing back into the animal's body thus reducing body temperature. The horns can grow up to 12 feet, measured from tip to tip. Male Ankole have shorter horns that tend to face forward, and they are larger and more heavily built than the females. Whereas the world's domestic cattle are bred for milk production and meat, Ankole were bred for their exotic looks.